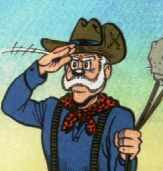 - F PM 01201 C : "The Sharpie of the Culebra Cut" (Lo$#10b), from 2001, by Don Rosa. The "Division of Police and Prisons" of the Panama Canal zone was organized on June 2, 1904. As its head, President Roosevelt specially selected George R. Shanton, a Western type of rough-and-ready sheriff. Shanton had been one of the then Colonel Roosevelt's "Rough Riders" in the Spanish-American War. Captain Shanton's replacement as Chief of Police was Grosvenor A. Porter, the son of a Confederate blockade runner, and a member of the Rough Riders during the Spanish-American War.